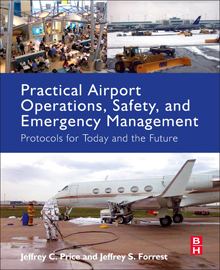 As the book's full title tells us, Practical Airport Operations covers airport operations, safety, and emergency management. While security management is not named there, it must come in; as the authors early on offer us the word 'aerotroplis', or airport city. An airport is like a small city, with its bustle and sheer number of bodies. This book has much to offer for various people; whether you work in airports, to get a feel for how it all comes together (and indeed must); or in the service sector generally or if your work has connections with airports, such as hotels, or transport. A useful lesson from this book that the wise security manager does not forget anyway is that security is a service; and as the authors say, the strictly airport side of an airport, including the security-screening of passengers (and airside staff) has to integrate with the non-airport-specific services, such as the shops. And all the time the passengers and cargo have to flow. As the authors set out, things that Operations has to respond to range from snow to something suspicious left behind on an aircraft, to a car parked on the perimeter; is it stalled, is it a hazard to safety or security? As so often, as the book is by American authors, the laws and regulations covered are from the United States; although as aviation is so international to state the obvious, that matters less than in some sectors. What are the 'operational challenges' foreseeable? Drones, for one thing; UAVs to give them their proper title are also covered in chapter 13 on 'emerging issues' (the authors suggesting that drones might be operating out of smaller airports, quite apart from enthusiasts operating them in the vicinity). The book goes into detail with safety, which understandably matters at airports; the security person may want to skip the details of runway lighting and markings. Security screening comes under 'passenger-related processes' that includes customer satisfaction, as was featured in the UK airport case studies in the January 2016 print issue of Professional Security magazine. The authors note that passenger behaviour has changed; rather than go through a long security queue and another check, passengers transferring will rather wait in a 'sterile area' for hours. The exhaustive book covers the safety and security roles of for instance the terminal manager, and the landside operations manager. Active shooters, for one thing ('in extreme circumstances ... the terminal manager often becomes simply another individual attempting to save him- or herself'). Towards the end of this mammoth work, we come to emergency planning and management, of interest for those working outside airports, if only to compare how airports do command and control, and communicate in an emergency. As it's America, hurricanes are a risk as much as fires or terrorism. On the other hand, anywhere there has to be an emergency response, there may be a psychological impact on the first responders, which is often overlooked, the authors say; and they go on to cover this. While security readers might want to skip the few pages towards the end about possible future spaceports, they may want to swell on the parts about UAVs ('there is no denying that UAVs are here to stay').